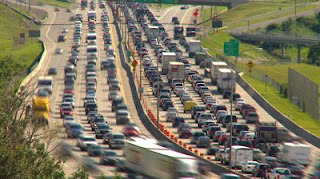 Coming out of Nashville during rush hour traffic Thursday, my nerves were a bit frazzled. I don’t like driving in Nashville, and I’m sure many of you can relate to that! I was on Briley Parkway, already past the Opry Mills Mall, and watching traffic with all I had in me. Suddenly from deep inside I heard “Pray”. Sometimes the Holy Spirit in us will direct us to do various things. He will tell us who to talk to, to pay that extra bit for the person in front of us at the checkout, to help a mom with her crying child, or to cook for those who are too sick to do it. But this time it was a simple “Pray” command. I started praying. I prayed for my safety, and the safety of those around me, looking at each car and the person inside and asking God to grant them mercy. This prayer was shorter than I expected as suddenly on the hillside to my right, about 20 yards from me, I saw a huge cloud of dust. There was a concrete wall below the hillside, which was going toward an off ramp. Suddenly a dark blue minivan appeared tumbling through the dust and then headed nose down to land on the off lane beside me. Traffic went from barreling down the road at 80+ MPH to around 50 MPH. I think it gave us all a good warning. I’ve gone through all the news channels trying to find out what happened to the passenger and how they got in that predicament. All I could see to explain it was one small red SUV in the area between the ongoing traffic lanes and the exit lane. I don’t know if one squeezed into the wrong lane or what, but she ended up going in the opposite direction and high up the embankment above the concrete wall. All that to say this. Earlier this week without being able to spend time doing my daily devotional as long as I wanted, I relied on the Daily Bread app on my phone. The September 1 article is titled “Because You Prayed”, and talks about how King Hezekiah received a scroll from King Sennacherib telling him that he was going to destroy his kingdom just like he had all the others. King Hezekiah took the scroll to the altar of them temple, spread it out before God and prayed and asked God for help. Soon after that the prophet Isaiah was sent to Hezekiah with a message found in Isaiah 37:21-35. It starts by saying, “BECAUSE YOU HAVE PRAYED TO ME against Sennacherib king of Assyria…”. I think the intention God was to give me in this was to show me that my prayers do matter. Sometimes we can pray for months, years even, and not see a result. We feel like giving up, like God isn’t interested in our concern. But God hears them every one and His word says that if we delight in Him, He chooses to give us the desires of our heart (Psalms 37:4). Continuing “steadfastly in prayer” (Romans 12:12) is to not give up when the acts of God are not visible, but to allow that time of waiting to increase our faith. We speak to Him with expectation of His answer, of His either changing our will to serve His purpose, or answering our prayers as we saw fit, with a Yes and Amen. Driving past that dust bowl and minivan sitting nose down on the highway, I saw a police car behind us with blue lights flipped on. He was there when he needed to be. Coincidence? I think not. None of the cars around me, including the small red SUV parked between the traffic lanes and the exit ramp, were hit. Coincidence? I think not. God has a reason for the things He asks of us. Prayer is as simple as a conversation with God. He’s been far too good to me to ever tell him “sorry Father, I’m too busy for you right now.” When He says Pray, I will pray.